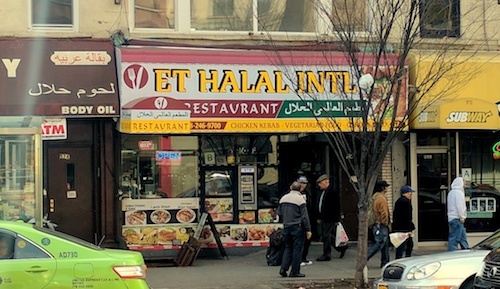 Please note that this small steam-table restaurant keeps changing names (its most recent name was simply Halal Int'l, before that it was Sabaa), but the people, address, and most importantly food, stay the same. The gigantic gyro sandwich ($6.50) comes from the beautiful spits and is loaded with lamb or chicken, lettuce, peppers, onions, and a beautiful white sauce. The steam table is always filled with tons of fresh offerings, and the place has a constant stream of halal seekers coming in and rapid-firing their orders, constantly proving my intuitions wrong. Taxi drivers in the area double park and fetch meals to take along, while neighborhood Muslims leaving the mosque a few doors down sit at the tables and enjoy food and conversation.